Above is an artist’s rendering of the new Graduate School of Business campus in Singapore. The new facility will provide more space in three buildings and will be located just north of Singapore’s central business district. 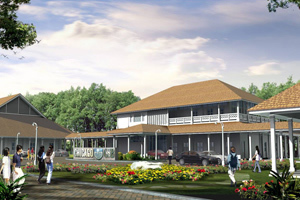 Plans were announced Thursday, Feb. 28 in Singapore for a larger campus of the University Graduate School of Business. The school will replace the existing facility, where classes are taught in an executive MBA program, according to Edward Snyder, Dean of the GSB and the George Pratt Shultz Professor of Economics. The project is expected to be complete in the summer of 2009. The larger campus, consisting of three buildings, also will allow Chicago GSB to offer non-degree executive education programs and programs by its Polsky Center for Entrepreneurship. The larger facility will provide an opportunity for other parts of the University to offer programs in Singapore, Snyder said. The new campus will be located in Tanglin Village, a park-like setting north of Singapore’s central business district, and will more than double the existing 22,000-square-foot campus. The school’s current campus, known as the House of Tan Yeok Nee, is 2 miles from the new site. 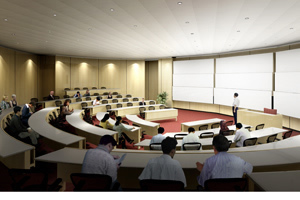 Shown above is a rendering of one of the new, state-of-the-art, two-tiered classrooms. The new campus will include two tiered, state-of-the-art classrooms, 18 group study rooms, a student lounge and 29 offices and meeting rooms. The space will also feature individual study areas and space for expanded career services and alumni affairs programs. “Our new location in Tanglin Village will create and sustain a platform that advances the standard for management education throughout the world,” said Snyder. Chicago GSB also has a campus in London in addition to two campuses in Chicago. Chicago GSB opened its campus in Singapore in 2000 in response to the demand in Asia for its executive MBA program. The program features the same faculty who teach in Chicago. Students enrolled in the executive MBA program attend classes on a part-time basis while continuing to work full-time. The most recent class included 92 students and represented 27 nationalities. More than half of the students commute to Singapore from other countries in Asia, Europe and North America. Chicago GSB was the first school in the world to offer an executive MBA degree in 1943 and is considered one of the leading international business schools. The school’s faculty includes many renowned scholars, and its graduates include many business leaders across the U.S. and the world. It is consistently ranked as one of the top business schools in the world. The Chicago Approach to Management Education is distinguished by how it leverages fundamental knowledge, its rigor and its practical application to business challenges. In addition to the executive MBA program, which is celebrating its 65th anniversary this year, Chicago GSB offers a full-time MBA program, an evening MBA program, a weekend MBA program, a Ph.D. program, open enrollment executive education and custom corporate education.